February 14 Valentine's Day Pink and red Every hour for 15 minutes, until 2 a.m.
March 17 St. Patrick's Day Global Greening Green Every hour for 15 minutes, until 2 a.m.
March 30 Earth Hour Falls will remain dark 8:30 - 9:30 p.m. Experience Niagara Falls as it's transformed into a palette of breathtaking colours with millions of sparkling lights and illuminated displays, during the Winter Festival of Lights. Festival’s illuminations occur nightly from 5:00pm to midnight. Every night from December 22nd to December 30th at 9PM. Each show during the winter Festival will be four minutes long. * All performances take place at 9PM unless otherwise noted. "To see the Falls at night is to be wide awake in the land of dreams"
Don't miss the unmatched beauty of the Falls at night when the Falls are lit in the colours of the rainbow! It is indeed a great sight that can never seen at anywhere in the world. The falls at night is like a fairyland. 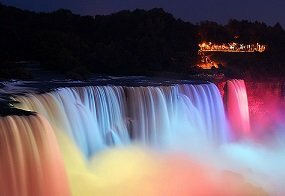 The hue of the lighted Niagara Falls mesmerizes and seizes every visitor to stay hours at the brink of the falls. Thousands of LED lights are fixed in three locations across the Niagara Gorge in Niagara Falls, Ontario. 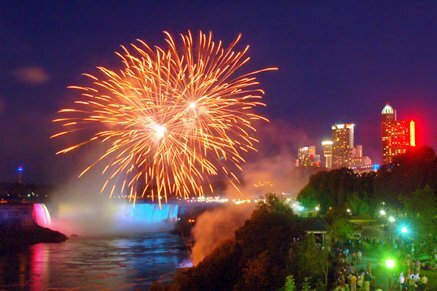 Throughout the year, Niagara Falls is illuminated for holidays and significant occasions, as determined by the Niagara Falls Illumination Board (NFIB). The falls are also lit in custom colors for short durations to mark significant dates in support of charitable causes. All the existing Xenon lights were replaced with new, energy-efficient LED lighting technology. These new lights provide very high lighting levels, and a wider spectrum of colour. Illumination of the Falls has been Financed and Operated by The Niagara Falls Illumination Board (NFIB) since 1925.